pilihan peminat: WHY IS THIS OF SOUTH PARK!?!?!?!? Any saat I feel like something really bad is going to happen... But nothing could. Could it? Miles Prower (マイルス・パウアー Mairusu Pauā? 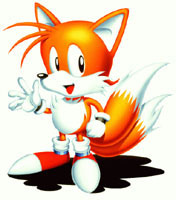 ), lebih commonly known sejak his nickname Tails (テイルス Teirusu? ), is a video game character in the Sonic the Hedgehog series released sejak Sega. He is a significant main character after the tajuk character Sonic, who is also his best friend. Tails also appears in his own spin-off series, in comic books, cartoons, as well as a feature film.